SEVENTEEN STATES, INCLUDING New York and California, have sued the Trump administration today to force it to reunite the thousands of immigrant children and parents it separated at the border, as the legal and political pressure mount to reconnect families more quickly. “The administration’s practice of separating families is cruel, plain and simple,” New Jersey Attorney General Gurbir Grewal said in a statement. The states, all led by Democratic attorneys general, joined Washington, DC, in filing the lawsuit in federal court in Seattle, arguing that they are being forced to shoulder increased child welfare, education and social services costs. In a speech before the conservative Criminal Justice Legal Foundation in Los Angeles, Attorney General Jeff Sessions defended the administration for taking a hardline stand on illegal immigration and said the voters elected the president to do just that. “This is the Trump era,” he said. More than 2,000 children have been separated from their parents in recent weeks and placed in government-contracted shelters – hundreds of miles away, in some cases – under a now-abandoned policy toward families caught illegally entering the US. 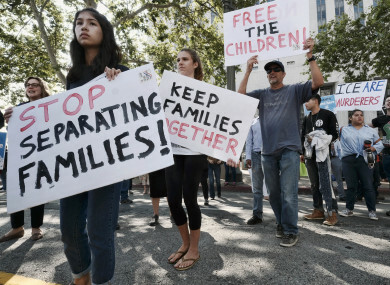 Amid an international outcry, US president Donald Trump last week issued an executive order to stop the separation of families and said parents and children will instead be detained together. Health and Human Services Secretary Alex Azar told Congress today that his department still has custody of 2,047 immigrant children separated from their parents at the border. That is only six fewer children than the number in HHS custody as of last Wednesday. “HHS, Homeland Security, and the Justice Department seem to be doing a lot more to add to the bedlam and deflect blame than they’re doing to tell parents where their kids are,” Oregon Senator Ron Wyden said. Tens of thousands of Central American migrants travelling with children – as well as children travelling alone – are caught on the Mexican border each year. Many are fleeing gang violence in their home countries. “The US government never had any plan to reunite these families that were separated,” Sandoval-Moshenberg said, and now it is “scrambling to undo this terrible thing that they have done”. Since calling for an end to the separations, administration officials have been casting about for detention space for migrants, with the Pentagon drawing up plans to hold as many as 20,000 at US military bases. At the same time, the administration has asked the courts to let it detain families together for an extended period while their immigration cases are resolved. Under a 1997 court settlement, children must be released from detention as quickly as possible, which generally has been construed to be within 20 days. Today, police arrested 25 demonstrators at a rally ahead of Sessions’ address. Outside the US attorney’s office, protesters carried signs reading, “Free the children!” and “Stop caging families”. Clergy members blocked the street by forming a human chain. They were handcuffed by police and led away. Later, protesters gathered outside the hotel where Sessions gave his speech. As the attorney general’s motorcade arrived, the crowd chanted, “Nazi, go home”. Email “17 states sue Trump administration over family separations at US border”. Feedback on “17 states sue Trump administration over family separations at US border”.